The vertebrate neural retina is derived from the ventral region of the forebrain. In this region, six classes of neurons differentiate and form the neural circuit underlying visual transduction. Thus, the retina provides an excellent model for studying cell differentiation and neural circuit formation in the vertebrate brain. Furthermore, more than one hundred hereditary retinal diseases causing photoreceptor degeneration have been identified in humans. Understanding the pathological processes of photoreceptor degeneration is an important issue from a medical perspective. We are currently investigating three research topics: (1) photoreceptor degeneration, (2) the role of microglia in retinal development and degeneration, and (3) lens development. In our lab, using different zebrafish mutant with a defect in the vision we study the degeneration process in the retina. gold rushis one of these zebrafish strain mutants, which show no photopic visual response, and slow progressive cone-specific photoreceptor degeneration. We found that the gold rushmutant gene encodes aryl hydrocarbon receptor interacting protein-like 1 (AIPL1). AIPL1 is expressed in photoreceptors and required for stability and membrane anchoring of a phototransduction molecule, cGMP-phosphodiesterase 6 (PDE6). We found that AIPL1 is an important protein not only for the phototransduction, but also for survival of cone photoreceptors in zebrafish. We previously reported that photopic vision and cone photoreceptor survival are affected in the eclipse mutant, a cone-specific PDE6 mutant (PDE6c). PDE6c has a central role in the metabolism of cGMP. Both zebrafish mutant strain, gold rush and eclipse, show a very similar cone-specific degeneration. When, we examined PDE6c functions in gold rush mutant by western blot analysis we found that the protein level of PDE6c was absent. We also found that cGMP level was higher in gold rush mutant than wild-type, and that gold rush mutation genetically enhanced photoreceptor degeneration in eclipsemutant. These data suggest that AIPL1 is required for PDE6 functions in zebrafish cone photoreceptors. Currently, we are trying to understand the role of the metabolism of the cGMP in the degeneration process using zebrafish phototransduction mutants. We expected that these findings would help to establish neuroprotection strategies for patients who are suffering photoreceptor degeneration. In vertebrates, lens epithelial cells cover the anterior half of the lens fiber core. During development, lens epithelial cells proliferate, move posteriorly, and differentiate into lens fiber cells after passing through the equator. To elucidate mechanisms underlying lens epithelial cell movement, we conducted time-lapse imaging of zebrafish lens epithelium. Lens epithelial cells do not intermingle but maintain their relative positions during development. Cell division induces epithelial rearrangement, which subsequently promotes cell movement toward the equator. These data suggest that cell division is the major driving force for cell movement. In zebrafish, E-cadherin is expressed in lens epithelium, whereas N-cadherin is required for lens fiber growth. E-cadherin reduced lens epithelial cell movement, whereas N-cadherin enhanced it. Laser ablation experiments revealed that lens epithelium is governed by pulling tension, which is modulated by these cadherins. Thus, cell division and cadherin-mediated adhesion regulate lens epithelial cell movement via modulation of epithelial tension. Mochizuki, T., Luo, Y. J., Tsai, H. F., Hagiwara, A., and Masai, I. (2017) Cell division and cadherin-mediated adhesion regulates lens epithelial cell movement in zebrafish. Development144, 708-719. Nishiwaki, Y., Suenaga, M., Araragi, M., and Masai, I. ER-resident BH3-only protein, BNip1, induces apoptosis in response to excessive activation of vesicular transport in zebrafish photoreceptor, in XVII International Symposium on Retinal Degeneration, Kyoto, Japan. (19-24 Sept 2016). Masai, I., Spatial regulation of lens fiber differentiation, in 23rdEast Asia Joint Symposium, Taipei, Taiwan (18-20 Oct 2016). Nishiwaki, Y., Suenaga, S., Araragi, M., and Masai, I. Mechanism that links vesicular fusion defects and apoptosis in photoreceptor, in The12th International Conference on Zebrafish Development (The Allied Genetics2016 Conference),Orland, USA (13-17 July, 2016). 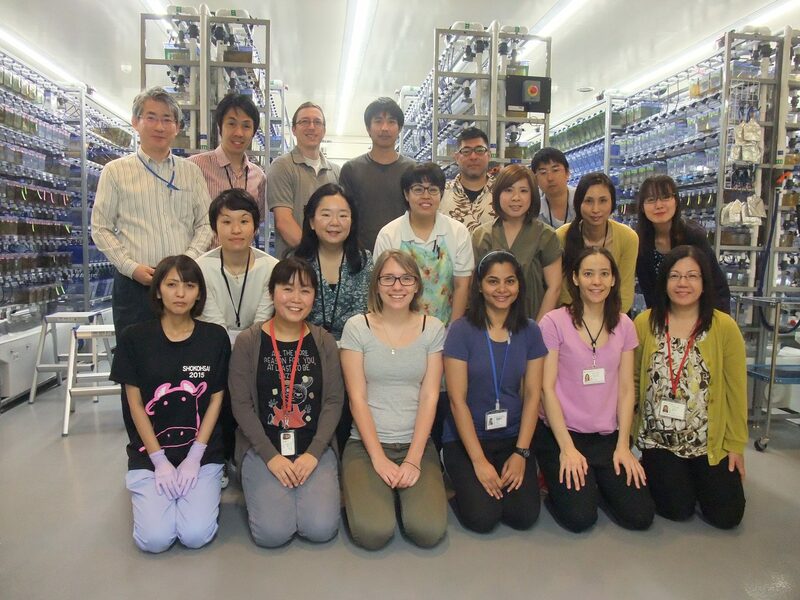 Iribarne, M., Nishiwaki, Y., and Masai, I. Mutation of AIPL1 produces cone photoreceptor degeneration through a dysfunction of PDE6c and GC in zebrafish, in XVII International Symposium on Retinal Degeneration, Kyoto, Japan. (19-24 Sept 2016). Masai, I., Mochizuki, T., Luo, Y.-J., Tsai, H.-F., Masai, I. Cell division and cadherin-mediated adhesion regulate lens epithelial cell movement in zebrafish, in Crystalline Lens 2016 at Wakayama: Basic and Clinical Aspect, Wakayama Medical University, Japan (4-5 April, 2016). Suzuki, S., Wong, R., and Masai, I. Mechanisms underlying cone photoreceptor specification and patterning in zebrafish in JSDB Special Symposium: Frontier of Developmental Biology Hosted by JSDB,Tokyo, Japan (2 June, 2016). Nishiwaki, Y., Suenaga, S., Araragi, M., and Masai, I. Mechanism that links vesicular fusion defects and apoptosis in photoreceptor, in The 39thAnnual meeting of the Japan Neuroscience Society, Yokohama, Japan (20-22 July, 2016). Hagiwara, A., Mochizuki, T., Kojima, Y., Nishiwaki, Y. Yamaguchi, M. and Masai, I. Induction mechanism of ectopic lens fiber differentiation by early endosomal trafficking defects, in The 9thRetina research meeting, Tokyo, Japan (10 Dec, 2016). Nishiwaki, Y., Suenaga, S., Araragi, M., and Masai, I. Mechanism that links vesicular fusion defects and apoptosis in photoreceptor, in JSDB Special Symposium: Frontier of Developmental Biology Hosted by JSDB,Tokyo, Japan (2 June, 2016). Ranawat, N., Nishiwaki, Y. and Masai, I. Brain colonization of microglia precursors during development and their role in neurodegeneration of zebrafish prim1 mutant, in JSDB Special Symposium: Frontier of Developmental Biology Hosted by JSDB,Tokyo, Japan (2 June, 2016). Kinoshita, N., Huang, A, McHugh, T., Suzuki, S., Masai, I., Miyawaki, A., and Shimogori, T. Delineation of neuronal connectivity employing intercellular GFP reconstitution method: GRAPHIC, in The 39thAnnual meeting of the Japan Neuroscience Society, Yokohama, Japan (20-22 July, 2016). Nishiwaki, Y., Suenaga, S., Araragi, M., and Masai, I. Mechanism that links vesicular fusion defects and apoptosis in photoreceptor, in The 39thAnnual meeting of the Japan Society of Molecular Biology, Yokohama, Japan (30 Nov-2 Dec, 2016). Hagiwara, A., Mochizuki, T., Kojima, Y., Nishiwaki, Y. and Masai, I. VSP45-dependent early endosomal trafficking mechanism that regulates lens fiber differentiation in zebrafish, in The 39thAnnual meeting of the Japan Society of Molecular Biology, Yokohama, Japan (30 Nov-2 Dec, 2016). Ranawat, N., Nishiwaki, Y. and Masai, I. Brain colonization of microglia precursors during development and their role in neurodegeneration of zebrafish prim1 mutant, in The 39thAnnual meeting of the Japan Society of Molecular Biology, Yokohama, Japan (30 Nov-2 Dec, 2016). Title: “Manipulation of Social memory stored in the hippocampus”.